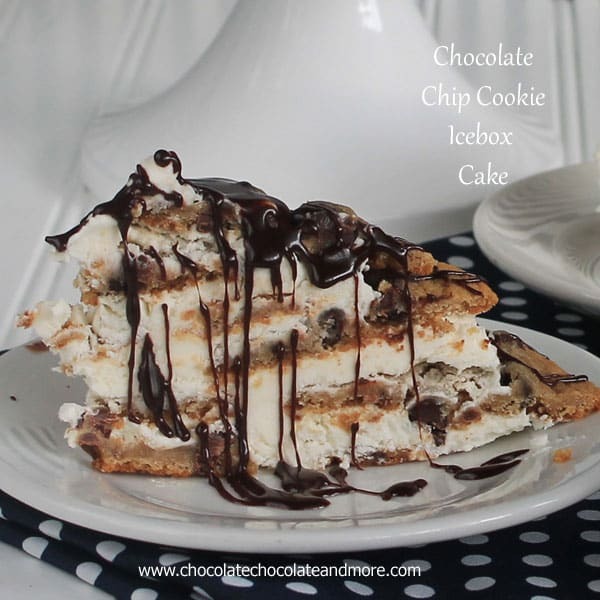 Chocolate Chip Cookie Icebox Cake - Chocolate Chocolate and More! 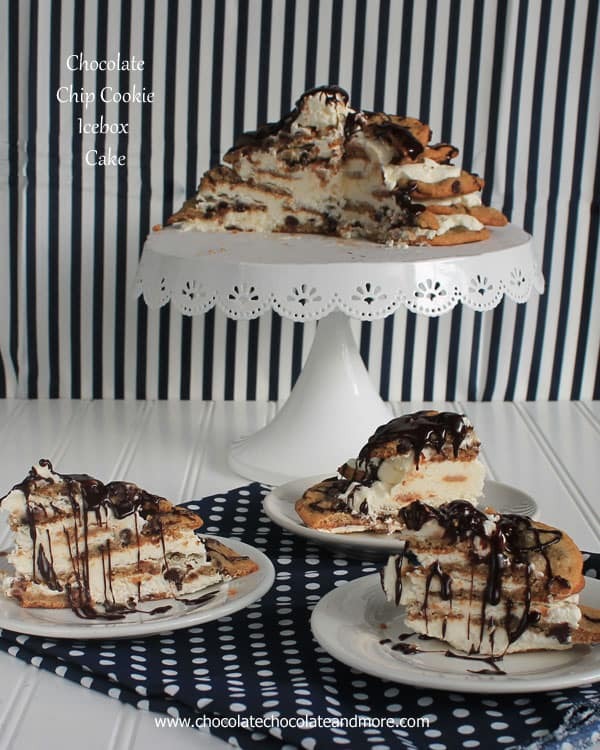 Chocolate Chip Cookie Icebox Cake-so simple to make, just cookies, whipped cream and some chocolate sauce! This has got to be one of the easiest, tastiest, most scrumptious dessert to put together. Ever. There’s no wrong way to do it. You can make it big, you can make it small. Make it to fit your needs. Or cravings. You can switch out the Hot Fudge sauce for Chocolate syrup or caramel sauce. 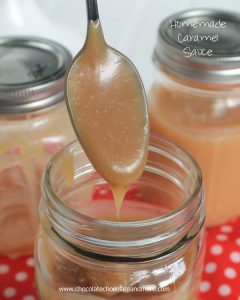 Or get really fancy and use chocolate and caramel. Or what about butterscotch? 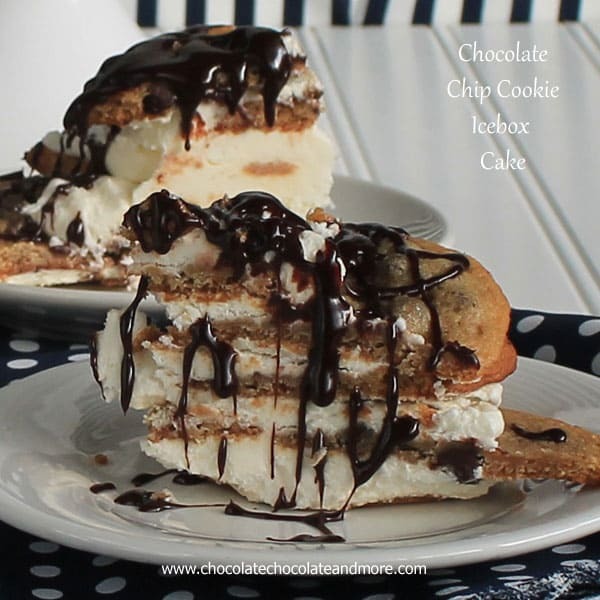 The key to this Chocolate Chip Cookie Icebox Cake is the waiting. You have to wait at least 12 hours (more is better) to eat it. For the cookies to soften to a cakelike state. Our proportions were a little off, almost running out of whipped cream, although if we hadn’t been eating spoonfuls as we stacked, we would have had plenty. Whip Cream with powdered sugar until peaks just begin to form, making whipped cream. 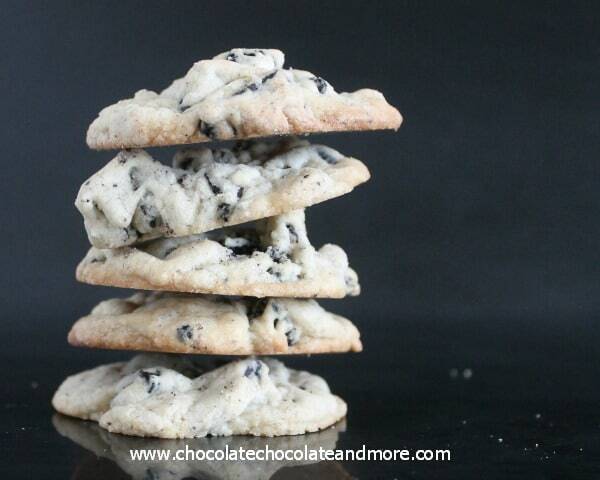 On a serving plate, place 5-6 Chocolate chip cookies to form a circle. 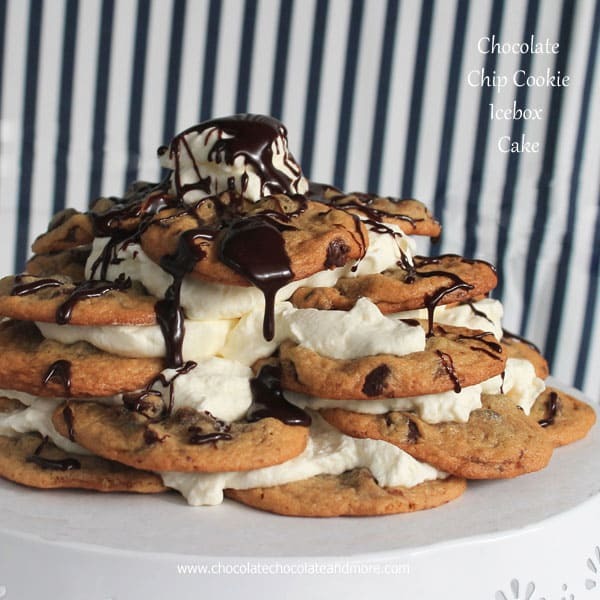 Place about 1 cup of whipped cream on top of cookies, carefully spreading to about 1 inch from outer edge. Second layer, staggering the cookies, place again, another 5-6 cookies forming a circle, on top of whip cream and first layer. Gently press down to secure layer. 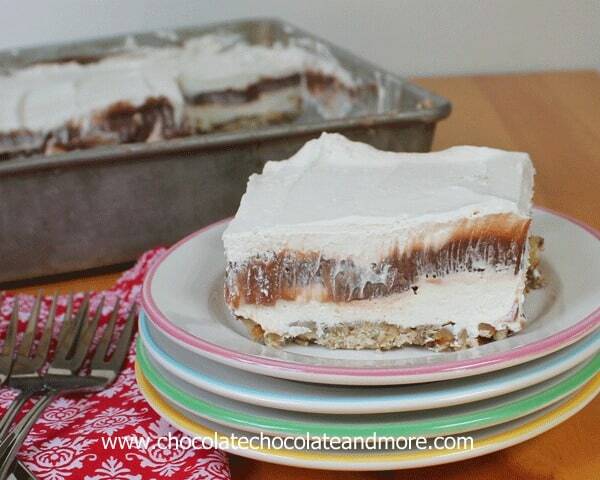 Place 3/4 cup whipped cream on top of this layer. Start narrowing your cake, using only 4 cookies, and 1/2 cup whipped cream, then 3 cookies and 1/3 cup whipping cream until you have the desired height for your cake with one cookie on top. Reserve about 1/4 cup whipped cream for garnishing just before serving. Cover cake loosely with plastic wrap and refrigerate for at least 12 hours before serving. 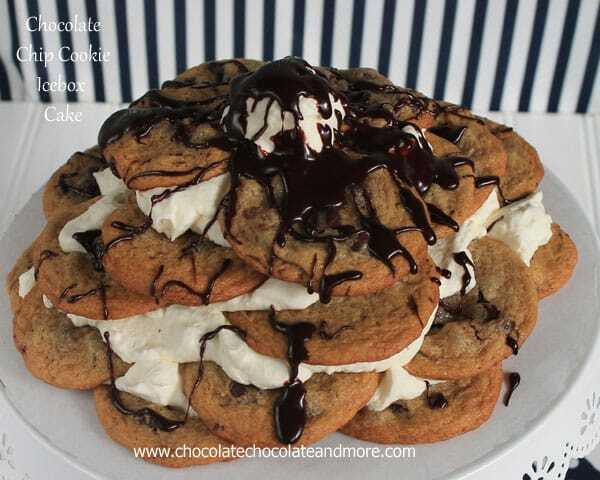 When ready to serve, garnish with remaining whipped cream and warmed Hot Fudge sauce. All measurements in assembling are approximate. 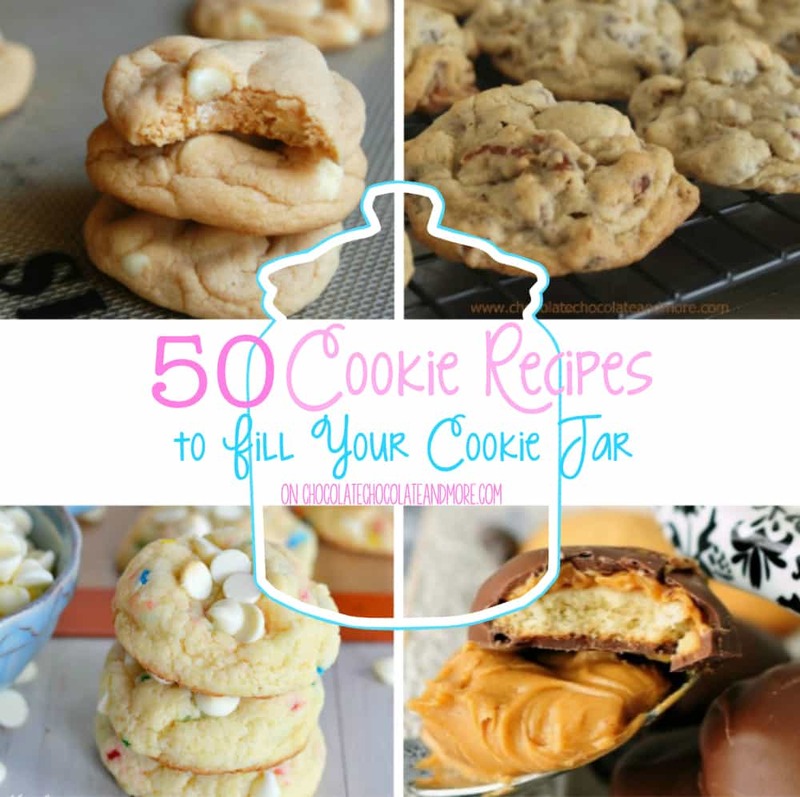 Use as many cookies as needed to get the cake as large as you would like it. 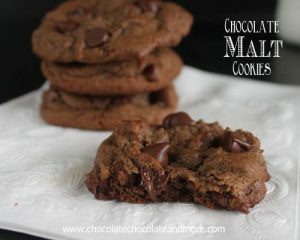 I might need to make two of these because I don’t plan on sharing mine! Get out!! 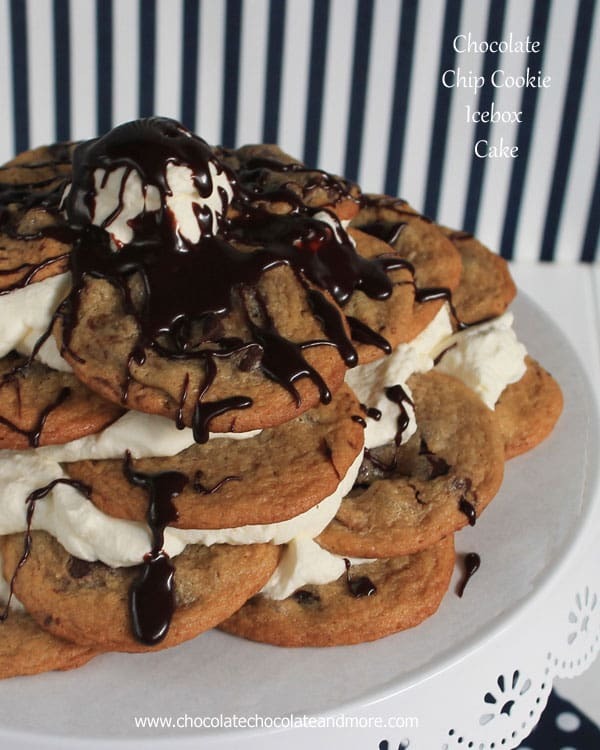 Did you really just stack up some cookies and cool whip and top with loads of hot fudge?!?! Why did I never think of that!? Pretty genius. And easy. Love easy. I think the picture says it all! What a scrumptious looking dessert! Saved and pinned! That is such a great idea. 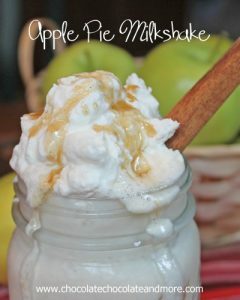 A perfect dessert to make with the little people too!